Poet Caitlin Doyle says she can trace her love of language and wordplay back to her childhood. She grew up in an Irish immigrant household where poetry and song were ever-present. Her father, who moved to New York from Dublin, was a bartender and often came home with tales of eccentric patrons—many of them writers. Those stories “stirred my curiosity and planted in me an early fascination with the literary life,” says Doyle. While so many young poets today are writing free verse or performing spoken word, Doyle often prefers a more formal style. “What thrills me most about rhyme and meter is the role they have played in the centuries-long relationship between poetry and memory. Using rhyme and meter can help a poet sear his or her words into the reader’s brain, an effect that reaches back to poetry’s beginnings as an oral art form,” says Doyle. One of her goals is to use language in a way that prompts readers to let down their guard and enter a poem for the visceral pleasure of the sounds. Often, she says, she likes to combine dark subject matter with an almost nursery-rhyme quality so the dissonance between sound and subject will heighten the meaning. Doyle says she felt compelled to write “A Brief History of the Bikini” when she discovered that the French clothing designer who created the swimsuit named it after the Bikini Atoll nuclear testing site because of its “explosive” impact on the viewer. She wrote the poem to explore cultural attitudes surrounding sexuality and violence, especially as girls grow into young women. And she used a form that would mirror the types of rupture she was exploring. of energy in small amounts of matter. by subtraction. Our skin remembers only air. 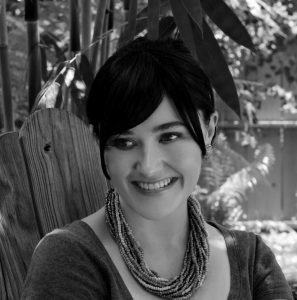 Caitlin Doyle’s poems, reviews and essays have appeared in The Atlantic, Boston Review, The Threepenny Review, Black Warrior Review and others. Her poetry has also been published in several anthologies, including The Best Emerging Poets of 2013, The Southern Poetry Anthology and Best New Poets 2009. 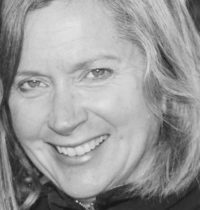 She has held Writer-In-Residence teaching positions at Penn State, St. Albans School, and Interlochen Arts Academy. Doyle earned her MFA from Boston University, where she was the George Starbuck Fellow in Poetry, and she is currently pursuing her PhD as an Elliston Fellow in Poetry at the University of Cincinnati, where she teaches in the department of English and Comparative Literature.